Death holds the answers to some of life's great philosophical questions. Man is born to die. God lives to be born. One day each of us will individually experience the universal event that explains these two truths: our personal deaths. Death holds the answers to some of life's great philosophical questions: Is there life after death? If so, what is it like? And, by the way, why are we even asking these questions in the first place? Then again, we may not even be conscious of what happens after we die, so I guess we could just forget about this book and wait to see what happens...if anything. Since death’s details will take care of themselves, until my own death, I am personally dedicated to discovering, practicing and sharing the serendipitous truths, which inhabit the joy of mortal life. By the nature of things, it’s not honestly possible for one to experience death before it occurs. Even the examination of near death experiences cannot be fully definitive because the subjects do not actually come back to report. The near death experiences found in popular books were not true death realities: neutral objectivity is impossible. Testimonies about spirits claiming to be souls who have “passed beyond” may simply be fallen angels who have deceptively taken on the identities of the deceased, for example. Then again, perhaps the claims are genuine. Such claims have yet to be proven scientifically one way or the other. And He said to them, "Why are you troubled, and why do doubts arise in your hearts? See My hands and My feet, that it is I Myself; touch Me and see, for a spirit does not have flesh and bones as you see that I have." Most people go through life not fully consciousness during most of their hours awake. They react to circumstances instinctively and not as a result of chosen thinking. Reacting to external circumstance makes one a victim of his personal misconceptions and self-misunderstanding. This book encourages you to take the road of spiritual consciousness less traveled. The first step to eternal life is to really encounter mortal life honestly right now. Besides, life is too long as well as being too short. So I hope you continue along with me as I ask and try to answer some more questions. By the way, I don’t expect complete agreement from anyone, just honest engagement. The natural universe is held together by the miraculously ordered operation of an infinite number of incredibly small bits of mass and minute bundles of energy. It is miraculous because its apparent order is manifested in a context of vast random chaos. This dynamic tension between ordered law and chaotic choice is discovered wherever science investigates. Not surprisingly, we also experience this universal presence of randomness in our every day life as thinking and sensate beings. But whether the subject of study be astrophysics or sociobiology, these essential and enticingly imponderable matters of life’s purpose and death’s role in it have been left for us to search out. Modern secular thought process owes much to the enormous impact of the ancient Greeks' philosophic and educational systems. The popularity of Greek philosophy has ebbed and flowed cyclically as promoted by scholarly proponents over hundreds of years. Greek myths subjected all gods to the power of the Fates or random chance. But unlike the ancient Greek's trust in the omnipotence of the Fates, any full and rational explanation of universe and/or humanity cannot be provided by such deities of divine probability - even if they are computerized or statistically supported. Today’s secular thinking is not far different from the ancient Greeks’ attitudes. Modern models of the universe leave us to the random luck of an evolutionary imperative without purpose other than to survive and remain active. In this spirit, state and local governments in the USA place their faith in the power of lotteries and games of chance to raise local economies instead of promoting a lasting, productive morality through ethical enterprise. Reason does not conclude that belief in blind chance, fate, or the practice of any strategy founded on random purposelessness will measurably improve life on earth – neither for humans nor for the rest of the biosphere. No religion provides effective solutions to the world's problems or even transcendent revelation sufficiently genuine to answer most of an individual person's own dilemmas or desperate perils that do not require some measure of faith in the unknown. My self resolution of these dilemmas focuses on better understanding human nature to the end that I abandon its innate, self destructive tendencies in favor of modeling the success of the natural universe's minuscule building blocks - vital witnesses left by God as clues. I perceive that the metaphysical realm of the universe is structurally paralleled in the physical realm, thus insights to spiritual realities may be found in the natural universe. Embracing mortality and the natural order of life honestly leads us towards experiencing immortality. Embracing the creation without worshipping it brings us to the Creator. 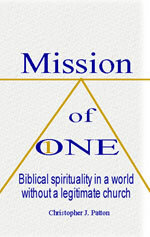 My belief and personal experience is that each person is called to a Mission of ONE, which is a small piece of the greater ONE mission or purpose of God. Although it may appear chaotic, an orderly wholeness exists in its ultimate unfolding. God has and continues to implement His grand design, a miraculously ordered operation of an infinite number of incredibly small bits of mass and minute bundles of energy, through individuals who become ONE with Him. It is miraculous because the Mission of One possesses purposeful order manifested within the vast universal context of random chaos. As humans indwelt by God’s Holy Spirit, each ONE becomes a bundle of His energized presence, purposed in love, randomly distributed throughout the globe. We are collectively left to chaotically exercise our God given right of free will - the power to decide as He is able to lead us. For the power of man lies in his decision, and the power of God is found through the alignment of man’s decisive will with God’s. Theology, philosophy and various social sciences have been helpful in my search, along with the many disciplines of physical science. But taken separately, each of them falls short of satisfying my wondering curiosity to understand (at least with some partial surety) the mysteries of being alive. One of which is that neither the inquiry about, nor the journey itself, can ever be fully satisfied (or completed) as long as we live. Another is our frequent feeling of being alone even as we yearn for safe and accepting communion with others in loving fellowship. While some branches of inquiry probe the outer reaches of the universe, others reach into the inner unknowns of the future of being. Although physical science is a powerful testimony, the most remarkable witnesses are found in the history of human experience. Indeed, our collective past yet influences the present and future course of human events. Its echoes yet resonate in the foundations of today’s global civilization. Our challenge remains to recast these eternal questions in the context of today’s hectic to frenzied rush towards lifeways dominated by a technology moving at speeds faster than human comprehension. Positive change does not occur by fiat. Growth is a gift that occurs upon its acceptance and nurturance. Growth is scary, uncomfortable and perceptively lonely. It involves risk and demands the denial of the ego in a psychological death necessary for rebirth and recreation. But the rewards for taking such risks are guaranteed, secure in Jesus’ resurrection from the dead and ineffably present now through the living intercession of the Holy Spirit. By this truth, I understand that the believer is never left alone. His personal battles will be victorious in Him, ultimately – because sometimes humans are confused as to what is true victory. The globe will one day see God’s forceful, political intervention with the return of Jesus as an immortal and omnipotent King of Kings. He will openly, externally establish truth in public society. God’s direct intervention in human affairs will end all forms of institutional evil and remove all excuses for humans to doubt the Creator’s existence and what He expects from them. So why do I write yet another book about life? After all, the bookstores are full of them, and I could just wait for Jesus to return and take care of these issues of spiritual revelation in person. I guess it’s because I see so much sorrow and suffering in this world and because I believe that God wants me to do something about it while I wait in faith for the promised second coming. It’s because each of us has a little different perspective, and I believe that we can gain insight from one another. Furthermore, God has blessed me with a deeply peaceful understanding of my own life purposes. This gift of understanding my own life has been personally worth the intangible frustrations suffered in the struggle to wrap my mind around a few whys and wherefores. I have found that there are indeed transcendent truths worth discovering. Perhaps my own search may be a help to you - just as I have learned from others. Because I owe much to others, I consider it morally responsible to share what I have received. So I hope that this book will positively contribute toward an understanding the world in which we live. In the course of any truth's revelation, the human mind reaches toward a partial but fulfilling comprehension and awareness of the eternal being most call God, so that just beginning your journey towards understanding God's purpose will make a difference in your life. I believe that part of the answers to my opening questions is found in the essential difference between living truth and lying words and deeds: truth evidences much greater power - to the point that it is ultimately invincible. It is the eternal endurance of truth that makes a lie out of everything else; therefore, honest truth is the beginning of a viable, productive faith as opposed to wishful thinking, misleading myth or predesigned propaganda. The joyous advantage of truth's triumph may be seen in the lives of spiritually successful people. Usually these men and women discovered significant truths early enough in their journeys for them to bear enough visible benefits to be publicly obvious. Most of the discovery and sorting out of any truth from the perceived realities of life occurs while we are children. As humans, we cannot escape the instinctively creative process of constructing a personally perceived-as-real world. This process begins at birth and continues throughout life; however, most of the work is done while we are very small - before six years old. What is done is passively engaged and mostly subconscious in dimension. Ninety per cent of what remains to be done is usually accomplished between the ages of sixteen to twenty, which leaves to the bulk of life a task of confirming our learned childhood assumptions and beliefs about reality. This is a reality defined here as ONE’s outlook on life and the external world, how ultimate (spiritual) reality is behaviorally applied with as much mental and emotional congruity as grace provides. The structure and composition of a person’s subconscious beliefs are witnessed in the fruits of his or her life, whether it is on balance productive or destructive. Perceived reality is a complex factor because everyone's creation of reality is a mixture of true and false, good and evil. What makes it so difficult for us is that this personally unique mixture of seemingly valid truths or facts of life is indivisibly melded together by the vast power of our multidimensional psyches, naturally hidden in the protective recesses of our subconscious. Consequently, we spend a tremendous portion of our lives learning the great and trivial truths by trials of both suffering and happy experience. This is the meaning behind the Genesis account of eating the fruit of the Tree of the Knowledge of Good and Evil. Many of our fully believed personal “truths” are (in objective fact) deceitful lies founded on petty to real fears, partial truths, misconstrued “facts” fabricated and allowed to reside in us as our conscious, willful justification for destructive attitudes and injurious behavior. It is difficult to unlearn these false “facts of truth” of ours, but we must do so to fully embrace life. We must do so even though we may suffer in the process or gain a glimpse of how these lying truths, once deeply held, hurt others or prevent us from achieving what we want out of life. In a positive sense, however, the trials of life can raise our awareness and revive our consciousness. Trials potentially provide the opportunity to raise our spiritual sensitivity and strength enough to unlearn false aspects of our personal reality constructs. The potential outcome is a process of continuous improvement that purifies our lives of the personal evils found in human nature. In order for evil to be defeated, a person must have a higher standard before his consciousness because there are limits to how much we can improve ourselves without God’s intervention. The help required is no less than His immortal presence within our temples of flesh. It is Jesus alive within the soul that empowers true transformation of the human being towards the promise of divine goodness in love’s perfection. Such a transformation is indeed the greatest of miracles, for the state of mind actually changes followed by a changed behavior, which conforms to this newly born persona or identity. In my grasp of these intangibles, I believe that a truly successful life for ONE person is only possible if it results in better lives for others as observed from an eternal perspective. The process of correctly discerning between the transient truths (or apparent realities) from the eternal ones (or the patiently working laws of the universe) provides access to the great fruits of reality transformation that change individual lives beginning with one’s self. Through the changed life of ONE, God works to significantly impact the lives of others - even millions. The power to make better living possible is universally available, but access to it is too rarely found. What is even more unfortunate is my observation that there are those who find a door to the power of personal transformation but misuse it to self-designed purpose. In essence they become perpetrators of partial or incomplete (hence false) truths in order to gain control and influence over others with the goal of personal glory, or other material advantage, at the expense of followers. Thereby have many people been sorely misused to abused, and millions have died. The key to limiting the negative risks associated with the misdirection of power lies in understanding that an individual’s decisive utilization of power is inseparable from its serendipitous discovery. Discovery forces a necessary choice upon the one who discovers. The most common reaction is to overlook or ignore one’s opportunity to exercise Godly power in living. This refusal to act responsibly may either be conscious or, as I suspect in most cases, below the level of one’s awareness. It seems that the lack of any decision to accept responsibility and act is a chosen path of avoidance, usually derived from fearful doubt, habitual mental dullness, self-deception or from a self-absorbed destruction of consciousness. The most common consequence of the material rush of life is an empty, stunted personality abandoned to neglect. Most active decisions to use power are exercised for materialistic gain and thus, are at their root self-preserving and self-serving. Inaction or non-engagement of life due to a fear of, or to a rejection of, responsibility is also recognized by counseling professionals as being egocentric, self-protective strategies. In either case the real culprit is our human ego's absolute unremittingly tenacious, striving struggle for its self-preservation by concurrently engaging in various degrees of defensive protection and aggressive extension of one’s identity or control over everything within his reach and influence. Such self-preoccupation destroys creative consciousness since the ego collapses upon itself in a chain reaction that used up the energy of life in an imploding descent through materialism to darkest nihilism. Some have managed the instant decision forced by power’s discovery to exercise it positively in their lives, but too many of those who stumble across the power latent in great truths ultimately misuse their discovery to serve dark ego driven ends. In the process, these tyrants - both petty and great - become absorbed in the exercise of a potentially vast but stolen power, self-deluded through the illusion that their serendipitous discovery made them the creator-possessors and directors of its controlling exercise over anyone found within their sphere of influence. This was the error of Lucifer who became our Adversary, Satan. But all power is ultimately sourced in the eternal Creator God. At the beginning of the dimension of time Lucifer fell, becoming the "Father of Lies." Many scholars teach that Satan’s fall came about because of this very same error of reality perception. Enthroned over the earth directly under God, Lucifer originally exercised God's power in the dissemination of the great truths about His creation. Lucifer forgot that God was the source of all his power by misconstruing his role as an illuminating transfer agent for that of owner and ruler, which is the Creator God’s alone. Belief in his own lie twisted Lucifer into Satan, the angelic leader of the dark rebellion against God. Satan peddled the same lie to humankind, as recorded in the Genesis account of Adam and Eve’s original sins, to the result that men and women generally attribute the richness, power and blessings of life to their own creative efforts or works. Instead of receiving their glorious discoveries of the power latent in great truths with humble submission to God, human tyrants seize the intangible reflections of such insights as being their own invention - just as the Father of Lies did. Therefore, the only possible result is mass deception of themselves first and then of the tyrants’ numerous allies and followers - who by default, abrogate responsibility over their own lives and so become the injurious instruments of both great and petty tyranny. Rather than recognize the Creator as the source and possessor of all power and embarking on His call for identity transformation towards a divinely eternal identity in His Holy Spirit, most try to seize the power of God for themselves, even that seizure is as limited as reconstructing God’s definition of righteous love to fit their twisted desires and behavior. Anyone partially successful in such a theft of power increases his or her risk of becoming captive to his/her own imaginary realities and ephemeral fabrications of their reasoning and emotional mortal beings - both conscious and subconscious. Instead of sensing God’s graciously undeserved mystical calling to His humble service, the power hungry turn down a path of self-destruction by serving empty ego exercises of extensive and expansive vanities. Instead of liberating, twisted truth enslaves multitudes by obscuring the true revelation of the universal call to individual purpose in life. Truth is the sword of the soul. The Word of God as originally given to humanity in material written form presents the infallibly dependable absolute truth. The Bible is the only spiritual reference source in material form that is available to mortals. Words full of latent spiritual power lie passively on paper pages waiting to be read and acted upon. Though the written words of God in the canonical Bible can be mistranslated, misapplied and misunderstood, they are accessible to our sensory perception. Properly understood in faith, the Bible rightly divides body and soul and spirit to liberate humans to immortal ONEness with eternal reality of omnipotent love known as God. Wielded rightly with forgiveness, it can cut out false knowledge about one's self, others, and/or personal sense of "reality" in order to promote healing growth. The written words found in the Bible can be twisted and distorted into the most effectively lethal tools in Satan’s weapons against the Truth and its adherents. …to us God revealed them through the Spirit; for the Spirit searches all things, even the depths of God. For who among men knows the thoughts of a man except the spirit of the man which is in him? Even so the thoughts of God no one knows except the Spirit of God. Access to the required power for a person to change his or her own human nature is found in a personal, mystical participation in the death and resurrection of Jesus Christ, God's only begotten and first born son of the earth. In this manner, the insignificance of one becomes the virtually unlimited power of ONE - a unity not to be defeated or destroyed. Many of Christian faith have mouthed this formula - most probably in sincerity. For two thousand years, Christian experience has often been personally satisfying and comforting enough to adhere to by choice for individual reasons and/or for social reasons, such as family heritage. But Christianity's success in the broader society is less than spectacular in spite of the fact that most of the positive values acceptable in our humanistic society are originally derived from the Judeo-Christian religious teachings and traditions. With a few exceptions, history is full of Christianized woe and demonic inhumanity. When they did arise, the terrors of Christian oppression have all come about as a result of mistaken beliefs that some man or group of people could speak for God as the judge of others. Judgment by human denominational rulers was established through the creation of interpretive laws and dogma in an attempt to regulate the thoughts and behaviors of the less enlightened masses of ordinary people. Such attempts to legislate righteousness and love are misguided in their inspiration and ungodly in their undertaking because man cannot put God in a book - not even the Bible. Human agendas remain human agendas even when espoused in the name of God and extensively referenced with biblical verses. God is whole totality: a unity of ONE beyond anything but the most imperfect comprehension of any one person, any group of people, any assembly of congregations, or indeed of all humanity collectively perceived. At the same time, I do believe that the expansion of fellowship beyond a single person does contribute to enhanced understanding of God’s purpose for us and that it is therefore essential to personal spiritual growth. So I conclude that there must be some missing ingredient or process to this well-known gospel formula for human purpose. The search for missing elements inspired a return to the essential social and psychospiritual elements of the gospel, which promise to release God's unlimited power of freely given graceful love upon a dying world. Although over two thousand years old, God’s omnipotent power of love is seemingly more needed today than it was even then, and that need is the key to what is missing. The beginning of salvation is recognition of its need. This is the truth that executed Jesus. Without repentance someone must die for guilt because without repentance sin reigns, and sin always yields the guilt that leads to death as well as other undesirable sufferings or evils. It is not just a matter of educated conscience or wishful, prayerful desire for what seems good to us. To begin the application of these concepts to our lives, think of a human being as being a stringed instrument (or other musical instrument, which would change the specifics of this analogy). The bouts (the shaped hollow soundboard and back), neck and pegbox (of a violin, viola, cello, etc.) are like our bodies. They come in different sizes and qualities of wood, varnish and other components. They may be externally modified to some extent, repaired and refurbished, but they essentially perform the function of catching the vibrations produced by bowing or plucking the strings and sounding them into the atmosphere mixed by its built-in qualities of resonance derived from the quality of its components and craftsmanship. The strings may be plucked and/or bowed being set by the fingers at variable intervals of length. How the musician plays the strings is analogous to how we psychospiritually or mentally (consciously or unconsciously, the latter through habit and simple reaction to external factors) engage life, which is to modulate the life force by our decisions and execute them through our bodies. The two put together create the music of our lives, which is broadcast as our distinct pattern, or set of frequencies, in that medium. Just as cables carry many digitized channels on one stream of electromagnetic energy, so the lives of all humanity are concurrently carried at the light speed of time elapsed to the ends of the universe. For some Yeshua is a stumbling block, a rock of offense. For others, Jesus is foolishness. Perhaps it would be helpful to picture Him as the large, round rock door to the Garden Tomb where He lay for three days and three nights. Behind that door ONE attains and lives pure love, peace, joy, immortality and omnipotence. Some persons decide to dash directly into the round rock door trying to break it down to get through. Others ignore what is behind the door deluding themselves that it isn’t worth it or that these good things are unattainable. “I am not worth it or able,” they might feelingly believe. They forget that Jesus Himself will roll it away if one but asks in faith. Then there are the many who have asked but just stand there staring and do not bother to enter in. They refuse to fully embrace death to self in faith because to them the tomb is empty: they are blind to the physical and metaphysical, transcendent reality of the resurrection. The mystery of the resurrection is that it applies to the believer as much as it Yeshua actually rose and appeared to hundreds of witnesses. The eternal reality is that Jesus is alive now and forever, and He is coming back to earth to reign. As ONE with God, a person thoroughly believes in unconditional divine grace and knows that his or her sins have been removed from metaphysical reality. Mortals can still remember their sins, but they are forgiven - actually non-existent in the realm and knowing of God. A true believer in God’s grace through Messiah also lives in and with the resurrected Savior and Son of God. When a mortal puts on immortality, then all memory of sins committed in the flesh vanish from his or her memory, too. Spiritual harmonization is the key. The Bible refrains from a long list of precise descriptives about how to live life materially. Moral instruction of specific dos and don’ts are swamped by spiritual principles. To live as a mortal human functioning within the world’s various societies and cultures but not to be spiritually in harmony with them is as much the art of balance as it is submissive obedience. It requires the engagement of intelligent, concerning and interactive consciousness. The key is not to be overly entangled and thus place obstacles in the journey to becoming ONE and/or in executing the Mission of ONE. The chief focus of human effort is the removal of obstacles to let the Holy Spirit direct the pattern of our mortal lives into greater harmony with God’s will. In this manner, God’s omnipotent power is released through us. We become ONE and the mission is executed. Through Yeshua/Jesus, we overcome the world: we do not fight it on our own power. We die to it even as we die to who we were as one. The old identity withers towards death from lack of choosing it even as the new identity grows within as we choose to conform the body’s behavior to the harmonic frequencies of God’s truth. The Bible is the sword of truth wielded by our conscious, thoughtful will to tune our chosen lives towards the ONE who is love. God grants us grace and enlightenment to do so even as He empowers each person’s individual mission part of the Mission of ONE by His omnipotent and righteous presence through the indwelt Holy Spirit, the ONE Spirit of the Son and the Father accessible through the ONE Mediator. “Do you not believe that I am in the Father, and the Father is in Me? The words that I say to you I do not speak on My own initiative, but the Father abiding in Me does His works. Believe Me that I am in the Father and the Father is in Me; otherwise believe because of the works themselves. "Truly, truly, I say to you, he who believes in Me, the works that I do, he will do also; and greater works than these he will do; because I go to the Father. Whatever you ask in My name, that will I do, so that the Father may be glorified in the Son. “I will ask the Father, and He will give you another Helper, that He may be with you forever; that is the Spirit of truth, whom the world cannot receive, because it does not see Him or know Him, but you know Him because He abides with you and will be in you. I will not leave you as orphans; I will come to you. “After a little while the world will no longer see Me, but you will see Me; because I live, you will live also. In that day you will know that I am in My Father, and you in Me, and I in you.